These Holiday Road Trip Essentials Will Make Your Trip a Little Easier! Make sure to pack essential medicines you might need. From Pepto to Ibuprofen to Neosporin and more. That way if anyone starts feeling yucky along the way, you have medicine on hand. I also pack some small trash bags in case someone gets sick along the way. Generally, one or more people in the car will be freezing (in my family it’s always me) and the other people will be hot. Make sure to have blankets on hand for anyone who needs to cover up can. I also have a pillow or two for anyone who wants to rest along our long car ride. I have forgotten our chargers before and learned from that mistake. If your kids have tablets, pack the chargers along with your phone charger. That way if you need to plug it in along the way you can, and you don’t have to worry about using your phone and the battery draining. Make sure to pack bandages, alcohol wipes, and more. You can buy pre-made first aid kits or make your own. You never know if someone will trip and fall and skin their knee. I know this is a simple one, but I can tell you some people don’t think to double check they have it and the card isn’t expired before they head out. Oil, antifreeze, power steering, are all great things to store in your trunk. If your car overheats you will be thankful to have items on hand. Batteries can die without any signs. Having jumper cables on hand will help if you get stranded and someone comes to assist you. Then you can grab your cables and hopefully hit the open road again. Make sure to have a paper mat handy in case your phone glitches or you don’t get service. That way you will have another alternative to find your way. If you have kids make sure to pack items like games, coloring pages, fidget spinners and other small toys to keep them busy along the way. I like to shop at the dollar section and buy fun toys for the kids so that they have something new to play with and keep them entertained. 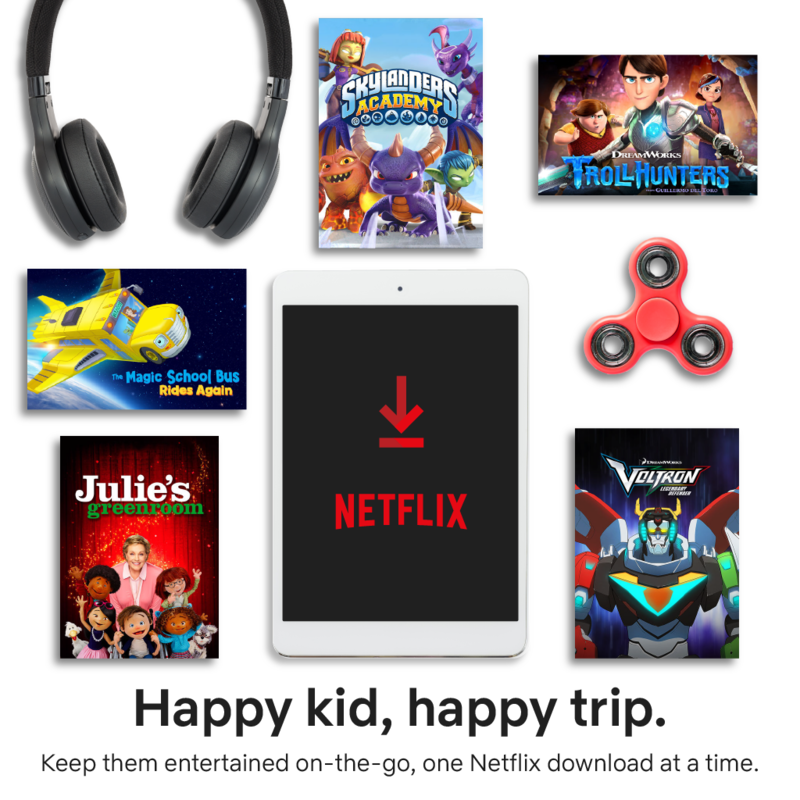 If they have tablets, download a new movie or fun new apps to keep their interest. This one is pretty self explanatory, but keeping the kids entertained while you’re on the road is everything. Otherwise you’ll be hearing “are we there yet” every five minutes for the whole ride. Pro tip: Make sure they all have headphones or ear buds so they can each stream their own Netflix show. If you are heading out on the road, these holiday road trip essentials will help make your car ride much more enjoyable! I always have something for the kids to do when we go on a road trip. We download movies ahead of time so that we can just watch them. And we each have a snack and a pillow and a blanket. Everything you mentioned here is what I love about going on road trips. This are great gift ideas. My son would want this entire list! Road trips are so much fun, but ONLY if they kids are having fun. Bored kids can get sooooo cranky. True story. I have a road trip box where I keep the things we use specifically for road trips along with a list of items we need, but are not in the box. This has proven to be very helpful. I am loving these essentials! Perfect for the holiday this weekend and all of the traveling everyone is about to do! These are all great things to keep in your car during winter road trips. Blankets are a must for when your car is still warming up! These are all great essentials to pack for a road trip. I love the download for later option on Netflix. It would be a great option for a long car trip. I love this list. I bring many of these items on road trips too. The kids always have activities and we always bring snacks too. When we go on our road trips we always make sure we have movies to stream. I think plenty of snacks, drinks,and a cozy blanket are musts! Don’t you need wifi to stream netflix? We use it in hotel rooms but never in the car. Being able to stream while traveling is seriously the best! It’s such a good distraction from the long car ride! These are ALL a necessity for road trips. Especially blankets and tablets. If kids can snuggle and watch something, they’re basically set! Great list. I agree with everything on it. Keeping kids entertained is key to smooth travel. Most of these we do keep with us. However, I love the idea of jumper cables. Sometimes it’s something that’s overlooked. I know we have overlooked it. These are really awesome tips! We will be traveling for the holidays and would definitely use these! Thanks! I’m the one who freezes in the car and I always have a blanket for road trips. Our car came equipped with a first aid kit, but I need to check it and make sure everything is up-to-date. Holiday road trips are so much fun! We always download Trolls from Netflix anytime we plan a road trip. It makes our travel so much easier, especially if we get stuck in traffic. I’ve no kids but when I travel I still have all these things. Especially toys, those are handy for keep adults distracted in the car too! Kids can make or break a fun family trip. It’s nothing against them; they just have the need to be entertained. Great essentials for making the trip fun! Luckily, we don’t have to travel far, plus our kids are all grown up (showing my age a little). These are great things to have to make the trip bearable. I love your list! We bring a lot of these with us when we travel. We won’t be traveling for the holidays, but we will over the summer. What’s a road trip without Netflix? This is a great list of things for surviving a comfy road trip with kids! My kids are grown, but how great it would have been to have Netflix when they were little. Great list to pass along to my young grandma friends! I am all for lists and love making my own as well as looking at other people’s ideas! You never know what your own list may be lacking. This is a great list of wonderful ideas for those holiday road trips! These are some great tips we are going away at the end of the week and could totally do with packing some bits up to keep the other half out of mischief. What a great list – thank you! We have learned our lesson that snacks (no matter what age your kids are) and chargers for electronics are LIFE SAVERS! We always bring the tablets with us on road trips. THey’re great for when the kids are getting restless and bored. These are great Holiday road trip essentials, I totally agree. I am going to have to bookmark this so I don’t forget anything on this list. Can’t get on a road trip with the kids if you don’t have entertainment with you! Love this list, it’s packed with all the things you need to survive that road trip! Fabulous list. It is so easy to forget things when you have so much to do. Great list! I should consider this list for our upcoming Holiday road trip. I am so excited! When planning a road trip, I will admit that I do forget many of these important tips. I had to learn the hard way about keeping jumper cables accessible in my trunk, if not for me but to help someone else if necessary! These are all crucial during a road trip! Netflix is a big one for me. On my next road trip (tomorrow actually for Thanksgiving) I want to try out the youtube RED subscription which allows you to download youtube videos to watch without using data or internet later on! We just did our 10 hour road trip yesterday! This is a great list, definitely don’t forget the chargers!! Thank you for this wonderful checklist! I would surely need it for the holiday trips! I’m as bad as the kids about Netflix, my tablet is the first thing I pack lol. You just reminded me that I need to buy some jumper cables, I loaned mine out never to be seen again and I am traveling via car next week. every kid would love this stuff! I love this list! We haven’t gone on a road trip in a while but when we do, I have started really preparing. I am a last minute packer but not when it comes to car entertainment. We could not travel without our netflx and our wifi! These two go hand in hand wherever my kids go. Thanks for sharing these tips! I pretty much do all of this and then I make sure the kids put on their headphones so I can drive in peace. Your tips are spot on. The first aid kit is a must on a trip, you never know what can happened! I find your list very useful! Happy Kid Happy Trip is the truth!!! The only way we make it through road trips: Planning, Power (chargers) and Plenty of snacks!! Great post and really great tips. YES! All of these are so essential. Road trips with my kids even though rare need lots of things for them to do.. otherwise they get bored super quickly or fight! no thanks. Great tips! Streaming is critical to our families road trip survival! We drove a rental all week and were so excited because it had a DVD player. That was silly, it didn’t work! And the kids ended up asking me to stop trying and wanted their iPads instead. I want to be on the stream team so badly! Maybe next year I can make it in. These tips will definitely be put to use this week. Oh my goodness! This is an awesome list, I will still manage to forget something.